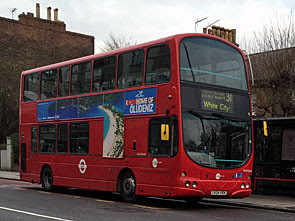 The 31 is an outer inner London kind of bus, orbiting the centre of town at a safe distance. It runs from Camden round to Shepherd's Bush in a none-too thrilling arc, but that's what happens when you pick a route at random, and blimey it could have been a lot worse. Even the starting point is round the back of the exciting bit. All the southbound buses are hidden in Bayham Street, with the 31 stabled outside a row of humble almshouses.... except, this being Camden, each now sells for a million and a half. Our driver-to-be has popped out of his cab for a fag, to enjoy some proper solitary time, until the next 31 parks up behind and he hops onto the front for a chat. Don't worry, it turns out he was only vaping, so the next-but-one ride to White City won't smell of smoke. We are the next bus to White City. Our first target is Camden High Street, not yet the part where the tourists throng, but the more ordinary part where local people actually shop. Our first stop is outside what used to be The Black Cap, north London's premier drag bar, which suddenly closed last April and now stands forlorn and boarded up after a proposed restaurant landgrab fell through. Whatever used to trade two doors down is currently being reborn as 'luxury flats', and LGBT campaigners fervently hope they can avoid a similarly tedious fate. Past the tube station the road is awash with jaywalking tourists, milling between boutiques selling bags and boutiques selling boots, because that's what they come to Camden to do. Various markets bear off to either side, replete with innumerable micro-retail opportunities, although Camden Lock Village Market beside the canal has been razed and awaits less interesting redevelopment as Hawley Wharf. There have been no stops for a while - no bus dares pick up between the tube station and the Stables - so a throng boards in the upper reaches of Chalk Farm Road. No visiting Euro-teen would dream of going where we're heading, diverting from the characterful main drag to service relentlessly residential streets in outer Camden. Primrose Hill may be only the other side of the Euston mainline, but Adelaide Road's a rather less cliquey world. The road climbs inexorably between two of the borough's postwar estates, one anchored by four tall (but well-spaced) tower blocks, each named after a prettier spot in East Berks. Beyond Taplow comes Swiss Cottage, first the wonderfully modernist library with its wheeled concrete fins, then a sudden long distance view from the corner of the gyratory. We'll be passing that far-flung Kilburn spire later. The 31 merely toys with the Finchley Road, its orbital mission requiring a prompt turn-off past the Post Office. Fairfax Road is not ideally suited to double deckers, and is easily blocked by, for example, a smart car parked perpendicular to the kerb and an Iceland delivery van. We have to wait while four car drivers attempting to come the other way slowly deduce that yes, they are going to have to reverse, and far enough back to allow us us pass. Ahead, eventually, is South Hampstead, one of those minor Overground stations that hides away from public consciousness, while the shops at the tip of Belsize Road appear to specialise in pizza and interior design. Residents on the right hand side of the street might well need tile and flooring specialists on a regular basis, while the flats along the opposite side resemble a string of telephone exchanges joined together and are more likely occupied by the fast food clientèle. As we pause behind a Deliveroo driver, another 31 sneaks up behind and overtakes, accelerating to get through the set of turning-red lights ahead of us. If you thought Abbey Road was all Beatles-glam you've not been this far up, where grim tower blocks called Snowman House and Casterbridge looms down, about as far from Thomas Hardy's idyll as it's possible to imagine. Our last dalliance with the mainline railway is on the approach to Kilburn, where the High Road is in transition from old to new. Our enforced halt at a yellow box junction allows perusal of The Old Bell, still characterful and appealing, and an adjacent block replaced by a too-typical boxy Tesco/Gym/Hotel combo. The other 31 gains enough of a head start to stay well ahead of us, mopping up passengers departing Kilburn Park station and then disappearing out of sight. It's taken two paragraphs to reach that spire we glimpsed earlier, which belongs to St Augustine's, a prime Grade I example of Victorian Gothic. This brings us to Kilburn Park Road, the dividing line between Westminster and Brent, where the former gets proper 19C terraces and the latter gets "an exceptional collection of private apartments and duplexes for sale". There are bursts of full respectability as we nudge the edge of Maida Hill, even a palpable sense of community around the corner shop cluster on Shirland Road, though we also get to suffer the less affluent end of Elgin Avenue past a boarded-up pub before the Harrow Road. Apologies, this is turning into a diatribe about whether the houses we pass look nice or not, but I'm afraid the wildly varied property portfolio along the 31 very much encourages this approach. And the contrast only increases. Crossing the Grand Union brings us to the Westway viaduct, and several of the estates that Westminster council never boast about. On the Brunel Estate we stop outside a shop window filled almost entirely by kitchen towels and toilet rolls from a variety of discount brands. A mere couple of turns later the retail offering has shot vastly upmarket, featuring bubble tea and bistros, reflecting an invisible fault line crossing into Notting Hill. Chepstow Road is lined with glorious white portico-ed terraces, Pembridge Villas doubly so, as we pass through parts of town anyone lower than a banker would find impossible to acquire. The proper prime properties are off down adjacent avenues, without a stream of buses and other traffic flowing past, and perhaps a little further from the souvenir shops at the foot of Portobello Road, where a Camden Town vibe briefly returns. Notting Hill Gate, where the 31 rejoins the mainstream, is considerably less quirky. It's also where the clamour of the disembodied iBus voice becomes somewhat insistent, warning that Holland Park station is closed and so this really would be a much better place to alight to catch the tube. It's now ten years since Emma Hignett's dulcet tones were first introduced - where would we be without her? Holland Park Avenue is probably the peak of the 31's residential aspirations, with elegant ascending terraces and crescents overlooking private gardens, and a bijou shopping parade to match. And it's here that we finally catch up with the 31 that overtook us earlier, slowed down by having to pick up miles of passengers it reached first. With the finishing line in sight, we win. Ah, Shepherd's Bush, where the influence of a certain shopping centre is keenly felt. Most of those on board alight at the entrance to Westfield, eschewing the delights of the traders round the Green, leaving just three of us to travel the final leg. This takes us up the delivery road between the megamall and the West Cross Route, before dropping us off... oh hang on. Since I was last here the direct route to White City Bus Station has been closed and all the businesses to the north of the feeder road demolished, as Westfield prepares to massively expand. A huge John Lewis will anchor the new development, which'll feature offices, over 1000 apartments and 'public realm', and add at least another minute onto every bus journey. And best not mention what they're doing to Television Centre across the road, best simply alight at the underused bus station with another route ticked off.